"Naworth Castle the resident of Howards, is a famous old castle not many miles of the border of England and Scotland and must have been very notorious in days 'o old of conflict with the two countries. 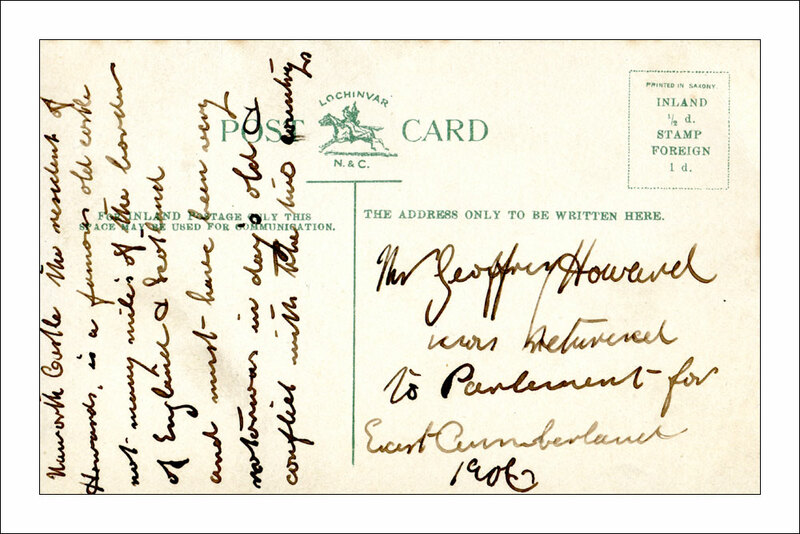 Mr Geoffrey Howard was returned to Parliament for East Cumberland 1906"
Old postcards represent wonderful starting points for a whole variety of potential journeys : so today let us briefly explore the political context of the card. Fowler Beanland was at the height of his postcard collecting activity in 1906 so we can assume that he acquired the card and added the inscription shortly after the General Election which was held between the 12th of January and the 8th of February 1906 (elections in Britain were at the time held over a period of time in order to manage the logistics of the operation). The election resulted in a Liberal landslide and the new government of Henry Campbell-Bannerman was able to introduce a series of major political reforms that were to radically change British society. Under the guidance of a new generation of political heavyweights such as David Lloyd-George, the new Government eventually forced through laws which saw the introduction of pensions, unemployment benefits and rudimentary health insurance. Despite his somewhat severe look and his own personal castle, Geoffrey Howard was one of the new generation of reforming Liberal MPs. He remained a Member of Parliament - with a couple of short breaks - until 1924 and, for a brief period in 1910, he served as a Parliamentary Private Secretary to the then Prime Minister, Herbert Asquith. Much of his work must have been behind the scenes in the smoke-filled corridors of power as there are relatively few of his parliamentary speeches recorded in Hansard. What there are, tend to be limited to such things as campaigns in support of the provision of Temperance Rooms in army barracks! 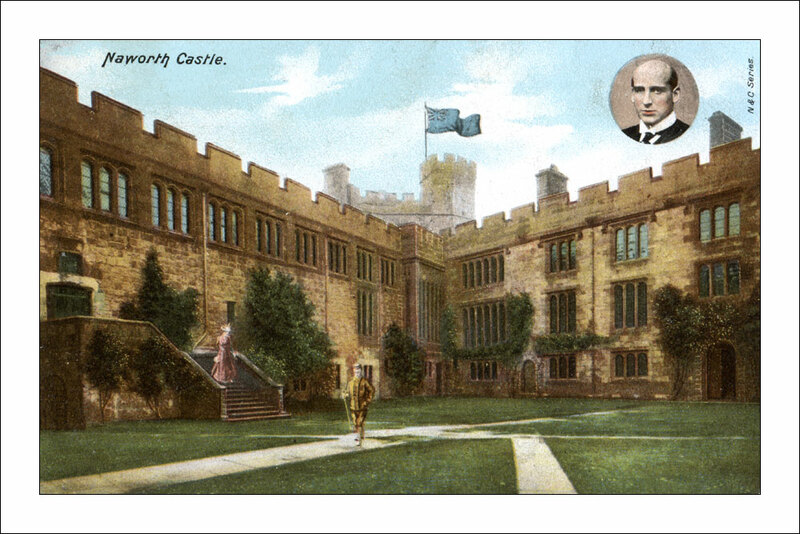 Naworth Castle is still standing today. If it seems familiar it may be because it has been widely used as a location for film and television productions. These days, you can visit it, have your wedding there, or host a banquet within its ancient walls. 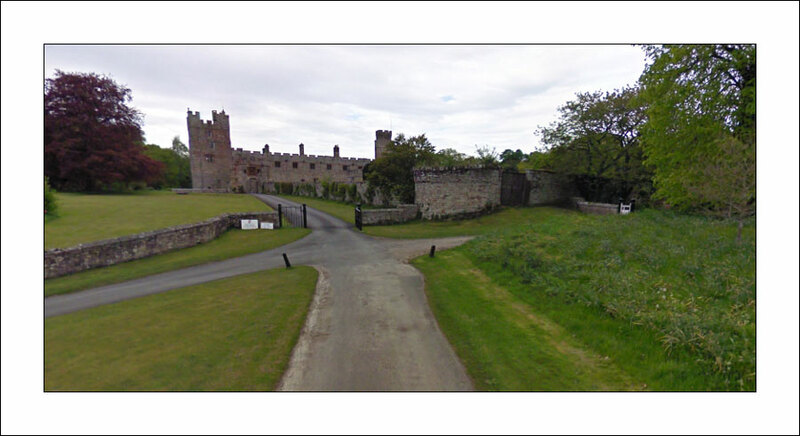 You can also make use of the wonders of Google Earth and virtually drive along the little country lane that leads from the main A69 road and passes the gates to the castle. There are worse ways to spend a cold and rainy day. I know that this is a photograph I have used on the blog before, but when I used it last, I converted it into a rather cold grey-scale image. So today I thought I would use it again, but in all its sepia glory. It shows my paternal grandfather Enoch Burnett, with his donkey and cart and his set of ladders in the early 1900s. I am not sure of the exact date : the inscription on the cart proudly declares that the business was "Established 1906" and the photograph was certainly taken before the Great War. I have written about Enoch before (see A Family Six Pack Part 2 : Enoch Burnett). He was the stuff of family legends: the one member of the family of whom tales were told long after he had died (in 1950). During the summer he worked as a window cleaner and during the winter - when the weather was bad and people in Bradford weren't bothered if they could see out of their windows or not - he traded as a watch and clock repairer. Although I cannot remember meeting Enoch (I was only two years old when he died), I can remember visiting my grandmother and discovering, in her little back-to-back house in Bradford, a treasure house of old long-case clocks - presumably goods brought in for repair and never collected. The picture is one of my favourite family photographs and I don't need too much of an excuse to dust it off and bring it out again : but the excuse is that I wanted to repeat the short description of the sepia toning process I gave when we first started Sepia Saturday. The term "sepia" was originally given to a brown pigment used by artists which was derived from the ink sack of the Common European Cuttlefish (Sepia officinalis). When, in the late nineteenth century, a chemical process was developed which converted any remaining metallic silver in photographic prints, to a sulphide - which is much more resistant to breakdown over time and which produced a brown-grey tone - it was called sepia toning. Sepia prints are more resistant to fading and chemical decomposition which is why most of the early prints we can still see are sepia toned ones. 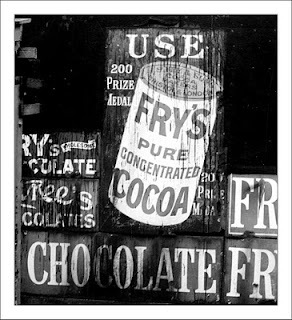 By the second decade of the twentieth century, photographic processing had advanced and chemicals were available which could reduce the amount of fading for normal grey-scale prints and sepia toning was used less and less. Eventually it became a specialist technique used to make photographs appear old rather than to preserve them. Your photographs don't have to be in sepia to become part of the Sepia Saturday project : just old and soaked in memories. To see other sepia posts this week, go over to the Sepia Saturday blog. Sepia Saturday will return on Saturday April 10th. A number of people seemed to think that the elderly, beer-swilling gent in the Pilsner Urquell sign featured in yesterday's post resembled me. To disprove such a contention for once and for all, I am featuring a new version of the sign with my face superimposed. There you go, we don't look a bit alike do we? Today is one of those "This And That .." posts. I used to call this series "Accumulated Fluff At The Bottom Of The Drawer Of My Subconscious Mind", but I have realised that life is too short. FUNERALS : Much of my day will be taken up with going to a funeral (an elderly ex-colleague of the Good Lady Wife). The local retail sector needs to be well prepared for I have discovered that, at this stage in my life, funerals make me acquisitive. I suppose it is the way funerals remind you that life is finite. Whatever the philosophical cause of the phenomena, I tend to return from funerals with fond memories of the departed and a carefully wrapped parcel or two. OBJECTS FALLING FROM THE SKY : The local news yesterday featured a chap from the other side of Huddersfield who has made a name for himself as an amateur space photographer. He attaches a digital camera to a weather balloon and sends it up into the stratosphere taking snaps of the earth below. Once its gone up 20 miles or so the balloon bursts and the camera falls back to earth. My local space explorer tracks it with a radio device, rescues the camera and plans his next mission. It sounds a fine idea, and I am sure it is - as long as you are not in the path of the rapidly descending Nikon Coolpix. If you happen to be in these parts today and see someone walking a dog whilst carrying a stoutly reinforced umbrella, stop and say hello. TIME DILATION AT THE SPEED OF LIGHT : If you do happen to be in these parts why not stop off at the Rock Tavern, Elland, this evening for the weekly pub quiz. I will be setting the questions - the "reward" for winning last week - and therefore you can guarantee that none of them will be unduly cryptic or abstruse! I have avoided the temptation of taking up the suggestion of my fellow-blogger Chairman Bill and incorporating the scientific questions he posed in his blog yesterday, one of which was "how long does it take for a photon emitted from the sun to reach earth? I won't give the answer away - you might want to ponder the conundrum whilst enjoying your morning coffee - but it has something to do with time dilation and the speed of light. 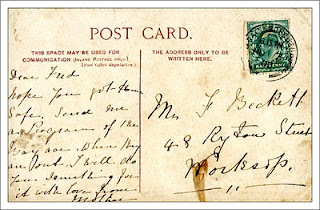 AND SO TO OUGHTIBRIDGE : The other day I did a vintage postcard post featuring a card addressed to Fred Beckett in Worksop. As with all such cards, all you have is a short message from which to try to put together the story of the people who both sent and received the card. Normally, a good measure of imagination is required. However, if you have readers and fellow bloggers who are genealogical geniuses you just sit back and wait for the full story to emerge. 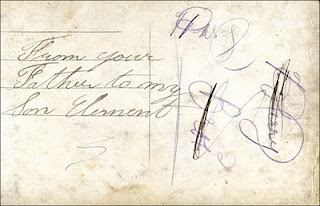 Jamagenie on her Saturday's Child blog took the postcard message and breathed life into it. Check her post out to read the full story. Strangely enough it involves a small South Yorkshire village called Oughtibridge (isn't it a wonderful name) which I know quite well and which has a fine pub I have intended to visit for some time. When I do eventually get there I will raise a glass to good old Fred Beckett. ANNOUNCEMENTS : The list of Sepia Saturday participants is up on the Sepia Saturday blog. These days most people post their link after they have put their Sepia Saturday post up (thereby including a link to the post rather than the blog) so don't be put off if there don't seem to be many names up yet. Next week will take us into Easter and therefore there will be no Sepia Saturday on Saturday 3rd April. Easter also means that towards the end of next week my posts will be more sporadic but I will return after Easter with, hopefully, a new look to the blog. If ever there was a Thursday Theme that called for a minimum of words and a maximum of images it is this one. So here is a small selection of signs that have appealed to me and my camera over the years. 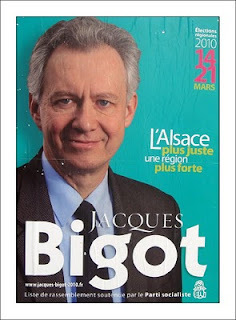 Some politicians do seem to have the most unfortunate names. Spotted in Alsace earlier this month. Taken in St Lucia last month, the sign is strong on prohibitions. Can we assume that bare fronts are allowed? The old ones are the best ones. I took this in Elland, West Yorkshire 40 or so years ago. I accept that there can be few things more introspective, more conducive to deep navel-gazing, and more potentially boring than blogging about blogging : but here I go again. Those who have read the last fourteen chapters of my forthcoming book "In Search Of A New Paradigm in Contextually Integrated and Networked Proclamations" will know where I have got to in my search for an answer to the age-old question facing us all : to consolidate or follow the advice of Chairman Mao and "let a hundred flowers blossom and a hundred types of blog contend". 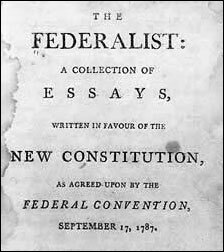 I was swinging very much in the direction of the consolidation school when I decided to investigate the counter-claims of the Federalists : and they have certainly made me pause for thought. I always think that the three greatest things given to the world by the United States of America and its diverse and wonderful people are (1) popular music; (2) innovative communications; and (3) federalism. I shouldn't have to say anything in support of my first choice being included in the list, the chances are we all support the nomination every time we hum a tune. As for innovative communications, all you need to do is imagine what that great British invention the World Wide Web would have been like if we had developed it on our own! Things like Google, Blogger and Facebook can only be American and - however annoyed we get with them - I believe they rank as great human achievements. Which leaves me with federalism. Now is not the place to venture into the political significance of the federalist writings of the great American pioneers - let it merely be said that we in Europe are still trying to learn the lessons 250 years later. 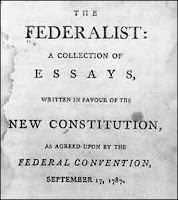 If we apply federalist principles to blogging what we have is a series of separate and quasi-independent blogs all gathered together within a common federalist framework. I can therefore keep Fat Dog, Pint of Bitter, and Daily Photo as separate States within the cultural hegemony of News From Nowhere. It is an exciting thought, I am sure you will all agree. I will ponder on it further and report my findings in the draft of Chapter 16. By way of diversion, let me conclude with a completely unrelated quotation. Yesterday, I found myself with a couple of hours to spare in Bradford Central Library. In the spirit of serendipity, I pulled a book at random from the shelves of the Reference Library and started to read. It was a collection of the reports of the "Female Sanitary Inspector" for Bradford - Miss C F Stephens - to the Health Committee of Bradford Corporation. 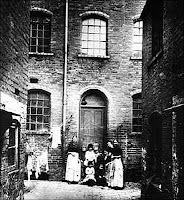 I quote from her report dated 31st December 1902 in which she tells of a visit to one typical slum in what, at the time, must have been one of the richest cities in the world. 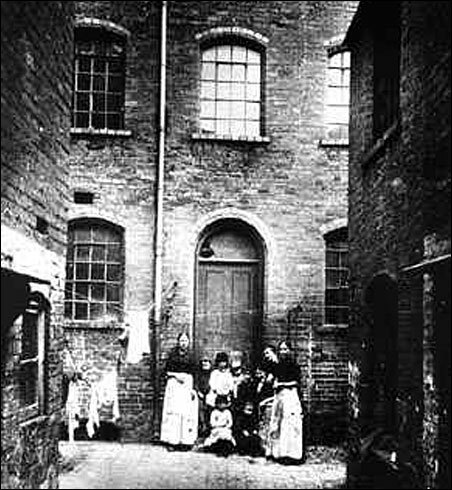 “Fourteen occupants in a three-roomed house. Bedroom : 1334 cubic feet, occupied by seven persons, equalling six adults. Bedroom : 810 cubic feet, occupied by three adults. The parents and youngest two children slept downstairs. The second time I visited this house the parents were in bed, and there were nine other members of the family in the room. In this case the woman resolutely refuses to allow a window to be opened, “for”, she says, “that is how scarlet fever comes into the house”. Meanwhile the filth of the house and the impure air, added to the gross overcrowding, render it a perpetual wonder that the whole family are not the victims of some loathsome disease. These people are now under Notice to abate the nuisance, as they declined to do so without pressure”. If nothing else, it makes you think and helps you get things in perspective. As I say, it is completely unrelated to the first part of this post. But now I come to think about it, it raises the question of how we can open the windows of our blogs to fresh ideas without risking the dangers of scarlet fever. I obviously need to lock myself up in a dark room and do some thinking. 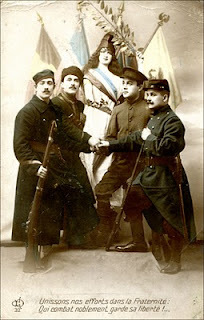 Each week I take a random dip into my collection of vintage postcards and investigate what comes out. Charles Dana Gibson (1867 – 1944) was an American graphic artist whose work was widely published in books and magazines in the late nineteeth and early twentieth century. As this period coincided with the golden age of postcard collecting, his pen and ink sketches were also a popular subject for postcards. He is perhaps most famous for his depiction of the stylized, wealthy and glamorous new-century woman that became known as a "Gibson Girl". The style and look is said to have been based on that of his wife Irene Langhorne and her sister Nancy (who would later marry Waldorf Astor and - as Lady Astor - become the first woman to become a member of the British Houses of Parliament). As an early practitioner of the craft of syndication - selling your work to a whole range of parallel publications - Gibson became one of the most successful illustrators of the time, made a fortune, bought an island in Maine, and also bought Life Magazine. "Dear Fred. Hope you got home safe. Send me a Programme of the Bazaar. When they are out I will do you something for it. With love from Mother"
The card was posted in Gainsborough, Lincolnshire which is a relatively short train journey away from Worksop. It would appear that Fred had been to visit his mother. 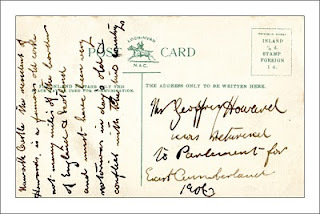 The "when they are out" phrase leads me to think that his mother might have been in service as a cook or housekeeper, this being the golden age of not only postcards but also of domestic servants. But what was the bazaar and who was Fred? Answers on a postcard please. Send them to me. One of the advantages of my exercise in consolidation is that it gives me the opportunity to revisit some of my more neglected blogs and attempt to bring them up to date. 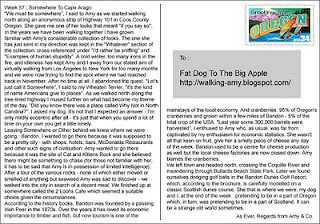 One such blog is "Fat Dog To The Big Apple". For those unfamiliar with this ridiculous project, let me give you a bit of background. I started the blog three years ago as an exercise in virtual reality, an experiment to see how accurately you could visit places using nothing but the power of the internet and the wonders of resources such as Google Earth. The idea was that I would take my dog Amy on a walk from Los Angeles to New York. We would actually do the walking, but it would be on the wet and grey streets of West Yorkshire. Each week we would transfer the miles walked to our virtual trans-continental walk from the Pacific to the Atlantic. We would use the full resources of the web to explore the places we passed through and report on the project via weekly "postcards" to the blog. Since last November we have been going nowhere, so it is time to restart. If I go ahead with my Grand Blog Consolidation plans I will send the weekly post to this blog in future : but until I make a final decision I will post to both blogs. 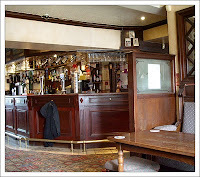 Step over the threshold of the Whitehall Hotel in Hipperholme on some quiet lunchtime and you feel as though you are intruding on someone's private grief. It is not an unusual feeling in these days when the majority of beer sales are delivered via the supermarket check-out rather than the polished brass hand-pump. Don't let it put you off calling by : the Whitehall is a fine pub of a type that is rapidly vanishing from the villages and townships of Britain. 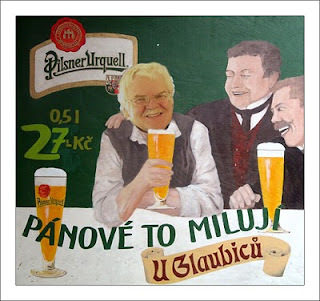 But be prepared for a chaser of melancholy with your lunchtime pint. The building dates from late eighteenth century and is currently Grade II listed. 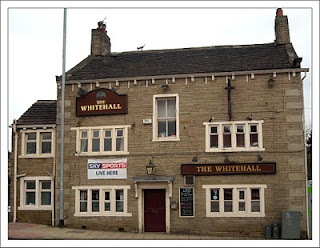 It probably took its name from the nearby White Hall House, but it is the pub which itself gave its name to the Leeds Whitehall Road which for much of the last two hundred years has been the main thoroughfare between Halifax and Leeds. 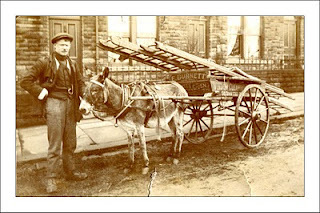 In the 1830s the Inn provided one of the stops for the regular stagecoach service between the two West Yorkshire towns : a service which had the surprisingly modern name of the "Red Rover". 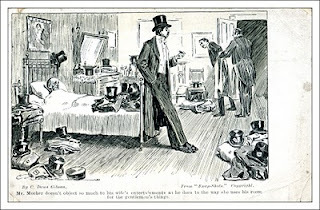 A picture exists of the interior of the Inn at the turn of the nineteenth century and from my own personal observations it appears that little has changed other than some of the regulars depicted in the earlier picture no longer seem to be attending. The ring hanging from the ceiling is part of a once-popular bar room game called "ringing the bull" in which a ring suspended from the ceiling would be swung to try and connect with a hook hung on a wall, often on the end of a bull's horn. Today the ring and the bull's horn are long gone but you still half expect the Dickensian gentleman with the stretched waistcoat to make his way back from the toilets (could that be his jacket which is still hanging from the bar?). 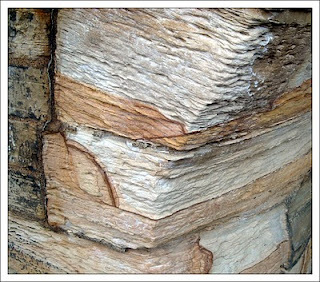 The decor is strongly influenced by tobacco and although in the two years since smoking in public was outlawed the aroma has drifted away, the tint still remains. I sometimes feel that you should be able to make out a special case for the current anti-smoking laws to be annulled in certain premises in order to maintain historical authenticity. The Whitehall Hotel could serve as a test-bed for such an innovative approach : the low ceilings and the mullioned windows set in the thick stone walls cry out for a patina of Old Shag. I had a pint of Copper Dragon Golden Pippin (3.9% ABV) which was probably historically an inappropriate choice - it should have been something old and dark and tasting vaguely of creosote. The Golden Pippin was none of these things and was rather refreshing. This goes to show that even I am willing to embrace modernity. Once suitably fortified by whatever your choice of beverage might be, and as you leave the pub and make your careful way across the busy main road, you might want to cast a glance back at the roofline of the pub. 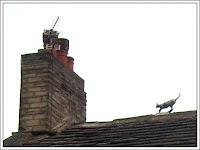 Is that a cat creeping along the ridge tiles? It has been frozen in the same position for many a year now - proof if ever it was needed that things move slowly around these parts. 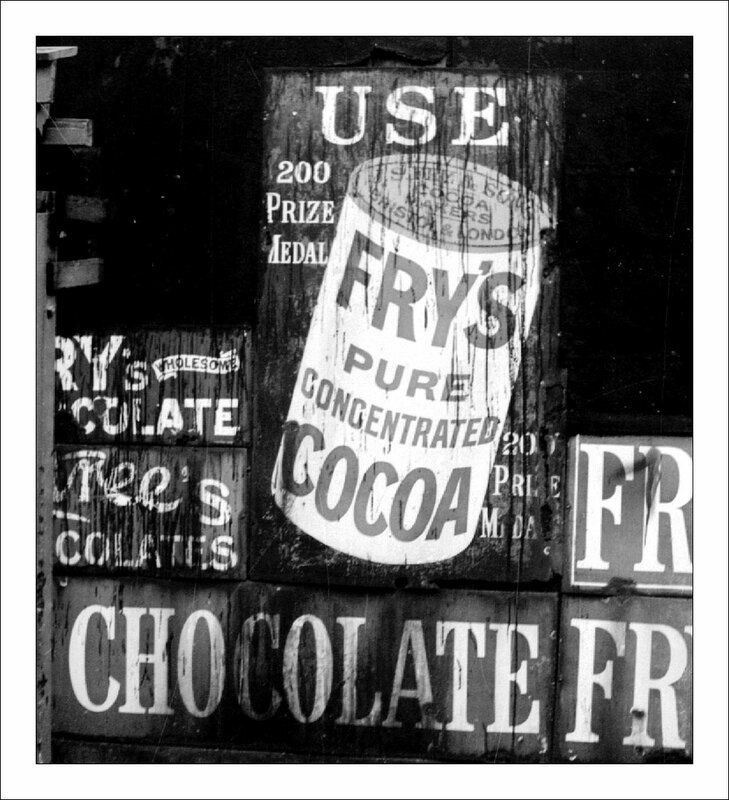 You know you are approaching your sell-by date when you discover that you are the subject of one of your own Sepia Saturday postings. 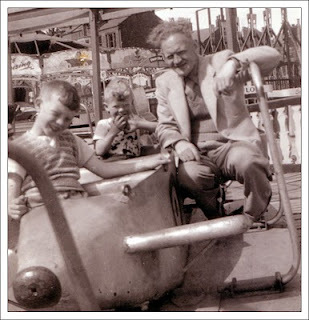 Why the above photograph - which shows my brother Roger, myself, and my father at some funfair or other - should be sepia I don't know. It must have been taken about 1950 or 1951, long after the introduction of photographic paper coatings which no longer degraded over time to give the familiar sepia shades. I suspect that the monochrome print had been left in the sun for too long and the fading process just took the edge off the blacks. It must have been taken in either Bridlington (on the east coast of England) or New Brighton (on the west coast). For some reason we would always alternate our family holidays between these two resorts - one year staying at a boarding house in Wellington Road, New Brighton, the next at a boarding house in New Burlington Road, Bridlington. Both streets still exist and I have just "visited" them using Google Earth and I am struck by how little seems to have changed - other than the fact that all the houses are now private residences. My brother is five years older than me and therefore must have been about seven or eight when this picture was taken. My father died in 2002 when he was 91 (I wrote about him last year in my Family Six Pack series). Roger went on to become an artist and a sculptor and he now lives on the Caribbean island of Dominica. And as for the cute little chap in the middle? He went on to do a little harmless blogging. You can take a look at the other Sepia Saturday posts by visiting the Sepia Saturday Blog. Most people now tend to add their link after they have posted so you may want to delay the start of your tour until all the links are up which should be by the end of Saturday. I have this grand dream : I will simplify my life by consolidating all my blogging activity into one super-blog. It will be the Crosby, Stills, Nash and Young of Blogs, the Three Tenors of on-line journalism. Some days it will feature photographs, other days it will rely on the usual fare of circuitous ramblings that I call writing. It will incorporate my efforts on Theme Thursdays and Sepia Saturdays and serve up the whole thing accompanied by a glass or two of my meditations on beer and brewing. But if it is going to work I need to master the art of balance : when featuring images, for example, I need to know when to stop wittering on and let the images do the talking. I was musing on this problem yesterday whilst I took Amy The Dog for a springtime walk along the banks of the Calder and Hebble Navigation Canal just down the road in Brighouse. The canal is a grand old piece of industrial archeology, over 250 years old and brimming with history. 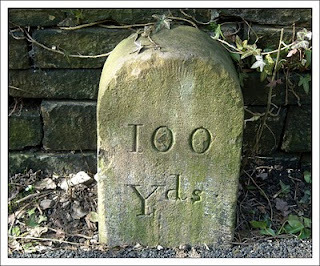 The stone markers (above) that record the distance to the next lock deserve to be preserved behind a glass case in a museum, but - I am glad to say - are not. Every time you come to a bridge you can trace where centuries of wear by the heavy ropes - used by horses to pull barges - have carved their story into the stone. You could sit a class of children around such stones and design a week's learning project on almost every aspect of science, history and art. And there is the sheer tranquility of a place where a rich vein of nature intrudes into the original testbed of the industrial revolution. My third picture shows the lock-keepers cottage at Ganny Lock a few miles east of Brighouse. In the background you can just make out a featureless concrete warehouse defiling the rustic romance of the scene. But hold on a moment. When the great eighteenth century civil engineer John Smeaton, designed the canal his proposals represented the very latest thing in technology. His plans were opposed by many a land-owner who believed his stone-lined cut would ruin forever their slice of nature. But Smeaton was a modernist who worshiped at the altar of progress. Not only did he build canals, bridges, harbours and lighthouses, he was also a noted physicist. Did you know, for example, that old John Smeaton was responsible for some of the most important developments in the theory of thermodynamics in the eighteenth century. Without his work it is unlikely that the Wright Brothers would ever have managed top get their plane to fly. It all revolves around what is known as the Smeaton Coefficient (k) in the equation L=kV2ACl, where L is ....... Alright, I will stop right there. I don't want to lose my balance do I? 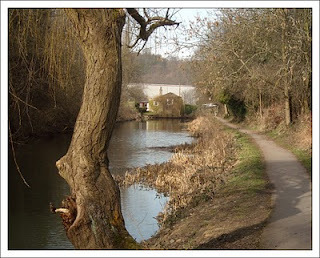 Especially when I am walking along a canal towpath. This is going to be a relatively short post - I'm hungry and I want my breakfast. The reason I haven't had my breakfast already is because I decided to be clever today and to scan it as my Theme Thursday post. Silly idea really. First of all there is the tea and the orange juice. The only way you can scan that is in the appropriate receptacles and all you finish up with is a passing hint of orange through the glass bottom (you will have to take my word for it about the tea in the cup). And then there was the toast - load of trouble that. If you put it on the scanner glass whilst it is still hot the whole thing steams up and you can't get a clear image. 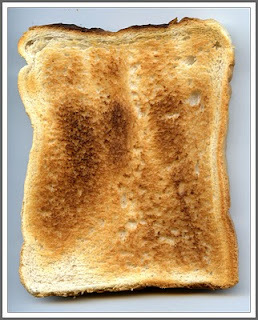 Wait until it is cold and not only do you have cold toast to look forward to, but toast which has by then had that weird electric blue scanning beam passing over it a couple of times. So I ditched the toast and turned to the tea only to discover that, by now, it had gone cold. So I ditched the tea and took comfort in the orange juice only to tip the whole bloody thing over on my desk. I have managed to mop it up but I have decided to abandon the exercise. In place of my scanned breakfast let me give you a very short trailer publicising one of my favourite CD's of recent years, Stacey Kent's "Breakfast on the Morning Tram". There is a verse or two from the title song hidden away in this Blue Note clip. To discover whether other bloggers had more success interpreting the Theme Thursday subject, take a look at the Theme Thursday blog. So What's This Blogging Thing Then? I am sure we are all well used to the question. "What's all this blogging thing then?" The questioner normally has a slightly incredulous look about them, unsure as to why you should list blogging as a pastime rather than some more suitable distraction such as dried flower arranging or amateur oxyacetylene welding. Blogging is often perceived as a form of latent exhibitionism for the functionally challenged, involving little else other than a list of what people might have had for their breakfast or what TV soaps they might be watching. Over the last 48 hours or so I have tried to explain the appeal of blogging to a couple of friends but I feel that I have fallen short of doing it justice. I have tried to enthuse about the variety of subjects and views you are exposed to and the variety of forms blogging can take. I have explained how some bloggers will use prose others poetry, some art, others photography. 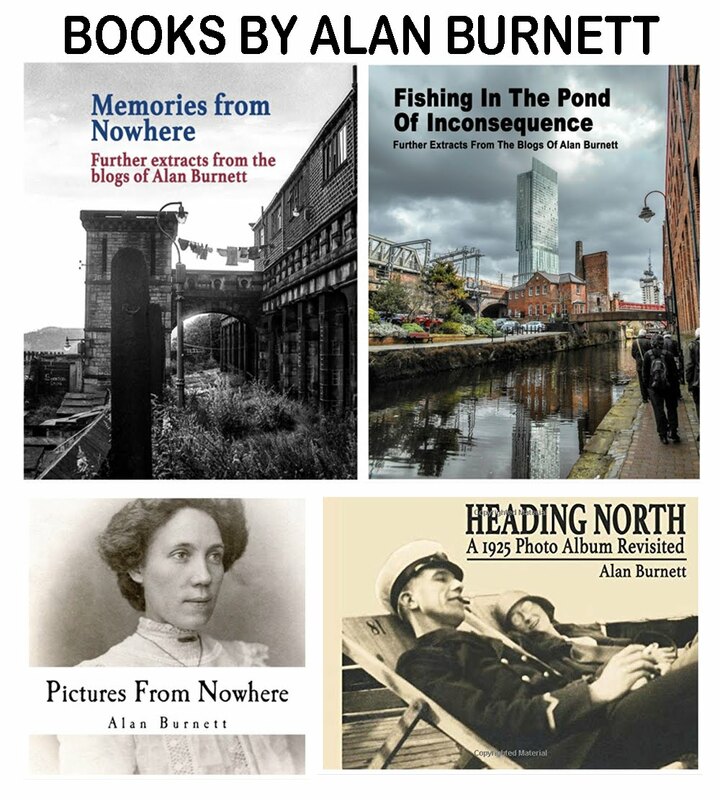 I have suggested that a blog is more like a self-published magazine than a catalogue of daily diary entries. I have tried to convey the richness and diversity of the world of blogging but have been left with the fear that my listeners still see blogging as a symptom of having too much time on your hands. It is a pity that I can't seem to get over the seriousness of blogging and the fact that it is up there with lace doily making as an art form. Had the technology been available, Shakespeare would probably have blogged rather than written all those plays. 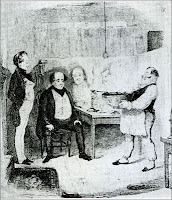 In many ways, Dickens did blog even though the technology wasn't available. We bloggers are at the cutting edge of a creative and artistic tsunami and it is just a shame that other people don't recognise this. There are two things different about my Sepia Saturday photograph this week (three if you want to be pedantic and point out that it is monochrome rather than sepia). First it is of a place rather than a person. The place is the fishing village of Clovelly in Devon. It was taken by my father in the mid-thirties (either 1935 or 1936 I would guess) whilst he and my mother were on a motorcycling touring holiday in the south-west of England. In those pre-digital days, film and processing cost money and photographic subjects were normally limited to family and friends. If you wanted a picture of a pretty view, there were plenty of cheap postcards available, Occasionally, however, a view would have been so stunning that Great Uncle George would be ignored as the camera focussed on the background rather than the foreground. 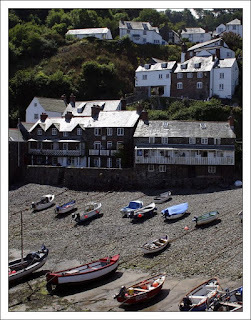 A visit to the near perfect fishing village of Clovelly where the fishing boats were dragged up the sloping beach must have been one such occasion. The great Sepia Saturday pictures tell the story of people and their lives. They tell of challenges and hardship and change. 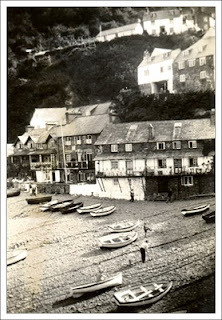 But occasionally it is worth remembering that some things change at a much slower pace : the beach, the boats and the cottages of Clovelly are, thank goodness, a case in point. There was a character in a book I once read (I have long forgotten the title, the author or, indeed, the plot) who, when asked how on earth he knew whether he was coming or going, replied that he just had a look to see which way his hat was pointing. I feel a bit like that this week : except that I fancy I might have my hat on the wrong way around. 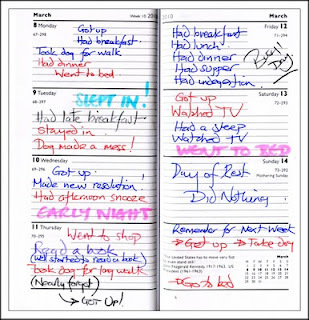 Following the recent long holiday and the even more recent trip to France, I am having difficulty getting back into a routine. I don't know whether I am coming or going. 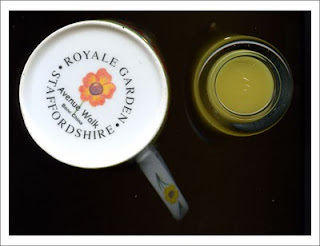 I have managed to get a few blog posts up, but I am way behind on my visiting and I suspect that there is such a back-log of posts I need to read that my best hope is to simply wipe the slate clean and start afresh. If I have missed out great chapters in the colourful lives of my blogging friends, I apologise : I will carry on reading the tales as they unfold and fill the missing bits in with my imagination. It is Theme Thursday and the subject this week is hats. I was tempted to let TT pass this week in order to carry out further research as to whether I was coming or going, but once I saw the theme I had to join in. Hats are a great favourite of mine on both an aesthetic and a practical level. Aesthetically, and with the possible exception of a macaw, nothing sits better on the top of a man's head than a good hat. 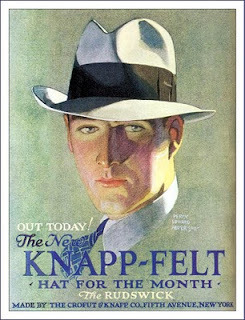 How I wish that I could have been around in the days when a man could wear a decent hat without being accused of being dissolute : in the days when the Knapp-Felt Hat Company could introduce a new hat every month. On a practical level I do wear hats on many occasions in order to protect my precious cochlear implant from the ravages of the English climate. When you are walking around with a few thousand pounds of microscopic computer equipment stuck on the outside of your skull, it is always wise to provide it with as much protection as possible, whether it makes you appear rakish or not. The top picture shows a selection of my hats. 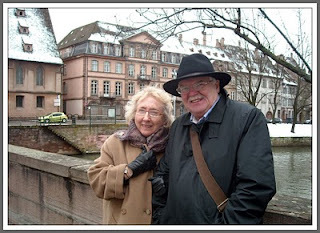 The one third from the left served me well during the recent visit to France as this final picture of myself and the Good Lady Wife, taken in Strasbourg, shows. Read how other people have interpreted this week's theme by visiting the Theme Thursday Blog. Sepia Saturday will be running again this week and if you would like to participate you can sign up over at the Sepia Saturday Blog. Now it is time that I started visiting a few of my blogging friends before they abandon me for ever. As Bob Dylan once nearly said, "You don't need a weatherman to know which way your hat blows"
Several people responded to my last post with questions : let me try and answer a few of them. Willow asked for more information about my visit to the Tate Modern. Because we spent so long looking around the Courtauld Gallery, we arrived at the Tate Modern about 45 minutes before it closed for the day. I could, however, put forward a reasonable argument for having compulsory limitations on the amount of time you are allowed to spend in an art gallery at any one time. A temporal sword of Damocles not only concentrates the mind, but also stops you from trying to cram too much in thereby risking visual indigestion. So all we had time to do was to take in the breathtaking building - for those not familiar with it, the Tate Modern is located in the old Bankside Power Station - and visit the wonderful Miroslaw Balka "Box of Darkness" installation. The installation is a gigantic grey steel structure which stands in splendid isolation in the Turbine Hall. You can walk up a featureless steel ramp into the inside which is totally light-less. As you enter a little light filters in from the open entrance, but as you move further down the structure the darkness is almost physically palpable. You can't set foot in the structure without being either moved or frightened or both. 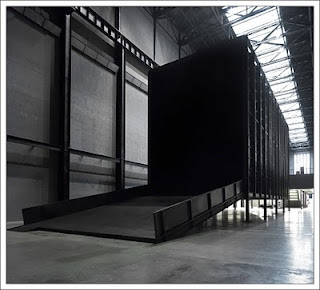 It is no coincidence that the artist Miroslaw Balka is Polish and Poland was the location of the killing camps of Treblinka or Auschwitz with their steel cattle trucks and death-black gas chambers. I thought it was a massively inspiring piece of art, one well worth experiencing. Baino asked about suggestions for places to visit in France. Let me first of all stress that I am no expert on the country and there are many parts of it that I have yet to visit, but it was my first visit to the east of the country and I was very impressed. Obviously there is a very significant Germanic influence - as John suggested in his comment, this area has been French, German and French again in less than 100 years - and in some ways it has more in common with Rhineland than the rest of France. 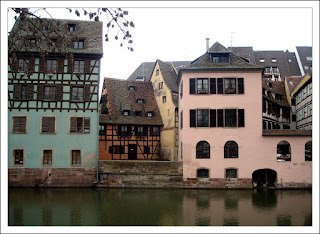 Strasbourg was visually stunning, with its old half-timbered houses and warehouses looking like rows of pastel-shaded boxes strung out along the riverside. Again, it is well worth experiencing. Several people commented on my picture of the castle (Chateau De Saint-Ulrich, Ribeauville). 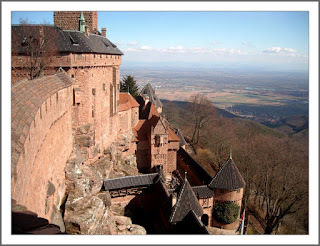 It was not the only castle we visited whilst we were away, on Friday we went to the almost unbelievable Chateau Du Haut-Koenigsbourg. 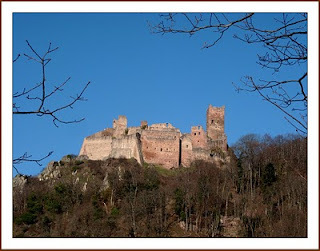 It differs from the other Alsace castles in that it has been fully restored to what it must have been like in the seventeenth and eighteenth century. The restoration was carried out under the direction of Emperor Wilhelm II whilst it was under German control at the very start of the twentieth century. It stands high above the Alsatian plain like an impregnable fortified box. 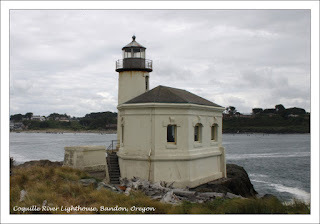 We visited it on a freezing cold day in early March and it was almost deserted. The arctic winds that seemed to penetrate the very stonework just added to the authenticity. And again, I would thoroughly recommend the experience. 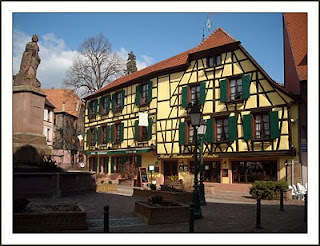 I am back following a most delightful few days spent in Alsace, Eastern France. It might have started as an excursion to see a Leonard Cohen concert - which, as I mentioned in my last post, was cancelled when the Sainted One fell off his exercise treadmill - but it finished up as a most successful exercise in cramming as much pleasure into five days as possible. There was a day spent in London which was evenly balanced between visits to public galleries (The Courtauld and the Tate Modern) and galleried pubs (the splendid George Inn in Southwark and several others to make up the set). There was a delightful day and a half spent in the small town of Ribeauville where we stayed at the almost unbelievable Inn pictured above, from where I climbed high into the hills to the even more unbelievable ruined castle pictured below. And there was a further delightful day and a half spent in the magnificent city of Strasbourg with its massive cathedral, ancient buildings and specially organised picturesque snowfall. Many, many great memories and a few half-decent photographs. Thanks to Tim and Will for being such amusing, eloquent and intelligent hosts and, of course, to Chrissy for being such a delightful travelling companion. There will, I am sure, be other chances to see and hear Leonard, but I wouldn't have missed my trip to Alsace for the half the perfect world. It appeared to be a perfect confluence of fortune. My good friend Chrissy and I had long been great fans of the sainted Leonard Cohen. 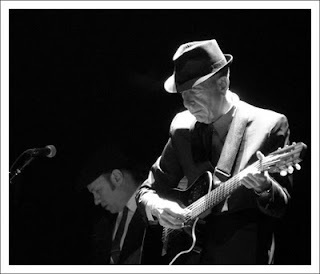 Leonard was due to perform a rare European concert in Strasbourg, France on Friday 5th March. Chrissy's eldest son Tim was spending a year in France as a teaching assistant as part of his degree in modern languages and was based in a small town about fifty miles from Strasbourg. We could kill two birds on a wire with one stone, and so a trip was planned which would take in Chrissy's second son Will, who is at University in London, a Eurostar journey to Strasbourg, a chance to see Tim, a chance to visit Strasbourg, and a chance to hear the sainted Leonard. But the best laid plans ... and all that. Leonard has suffered a sports-related injury and had been ordered to rest up for a few months and the concert is postponed until September. A case of "first we take Manhattan, then we slip and fall on the way to Berlin". But it matters not : Chrissy, the Good Lady Wife, and myself are still going on our trip. We will get the opportunity to visit some galleries - and some good pubs - in London and to explore Strasbourg and Alsace. And we will get the chance to meet up with both Will and Tim. We set out first thing Wednesday morning so I will miss out on both Theme Thursday and Sepia Saturday this week. However, the Linky list for Sepia Saturday 14 is already up so make sure you sign-up and I can catch up on all the posts on my return next Sunday. Please excuse my lack of posts this week and my tardiness in my visits to your blogs. I will be back soon, but in the meantime, so long Marianne .... and everyone else.